I’m not even sure how I ended up with this book, to be honest with you. All I know is at one point, it was a free Kindle download, and so I downloaded it, forgotten, until I was on a plane to L.A. and needed something to occupy a few hours. I had already read my trashy magazines and I think we were still in the sky over Ohio. Did I mention that there was no in-flight movie on this flight? Anyway, Be Now, Buddy What had initially appealed to me, enough to download it for free anyways, because of the unusual title, as well as its premise: a man falls from the sky and survives. He has no idea who he is, but he becomes the subject of a media frenzy. Everything about this book is a parody. It spoofs on the media, philosophy and religion, in particular, because Buddy is regarded to some as a Messiah due to his fall from the heavens and mysterious origins. There is some deeper meaning in the book, and it’s all about identity. Identity might be what reads off your driver’s license, but it’s also who you ARE. Buddy had no past, no family that he knew of, no history so to speak, yet he had an identity. 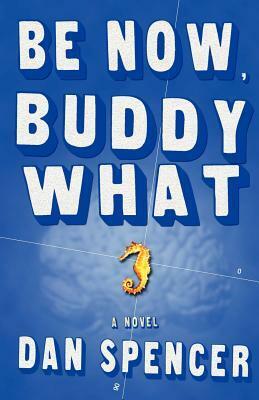 Buddy’s main philosophy, to “BE NOW,” is the same principle I believe Eckhart Tolle was trying to explain in his The Power of Now (see how much I despised that book here.) Live in the moment. Don’t live for the future or dwell on the past. The only time you have is the time that is happening right now. I really enjoyed this quirky, ridiculous tale. Told by a news reporter who just happened to be the first on the scene, and thus became Buddy’s embassador (I don’t think we ever know our narrator’s name), Be Now, Buddy What will make you laugh while at the same time make you question some of our cultural norms.